For a person with dry skin and a dislike for heavy perfume, I want to wear a lotion that will moisturize my dry skin without being oily and will smell nice at the same time. Bath and Body Works offers ideal moisturizers for everyday use. With their year-round sales, they are the best products for the price. Their lotions offer hydration without being greasy and their long-lasting scents are to die for. With nearly 100 scented lotions to choose from, it’s easy to be intimidated but rest assured: the store offers scents for all types of preferences. Some of my personal favorite scents are “Be Enchanted,” “Pink Chiffon,” “Carried Away” and “Secret Wonderland” which all offer light, sweet smells. These are all part of the Signature Collection, which are included in the store’s buy-three, get-three-free sale. Depending on a bottle’s size, prices vary but a 12 oz. bottle costs about $12.50. So with the sale, one can get six 12 oz. bottles of lotion for less than $40 — a steal considering that six bottles of lotion go a long way even for people like myself who use them every day. The store has some other amazing scents to offer as well. The store also offers other great products including soaps, body washes, body sprays, candles and other products I have been exceptionally satisfied with. The store also sells many men’s products: lotion, body wash, etc. 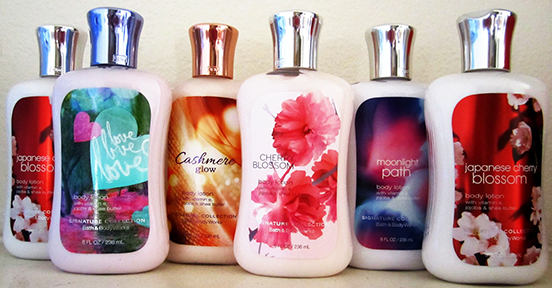 which all smell equally as good as the women’s line. Bath and Body Works is my go-to place for moisturizer. I have never been disappointed. I highly suggest this store for anyone looking for good products at affordable prices.